This OSPAAAL poster celebrates the Day of the Heroic Guerrilla, when Che Guevara is remembered in Cuba the day before the anniversary of his death on the 8th October. This simple black and white illustration by Olivio Martinez is nicely brightened by the stars and swirls of the orange motif to the right. 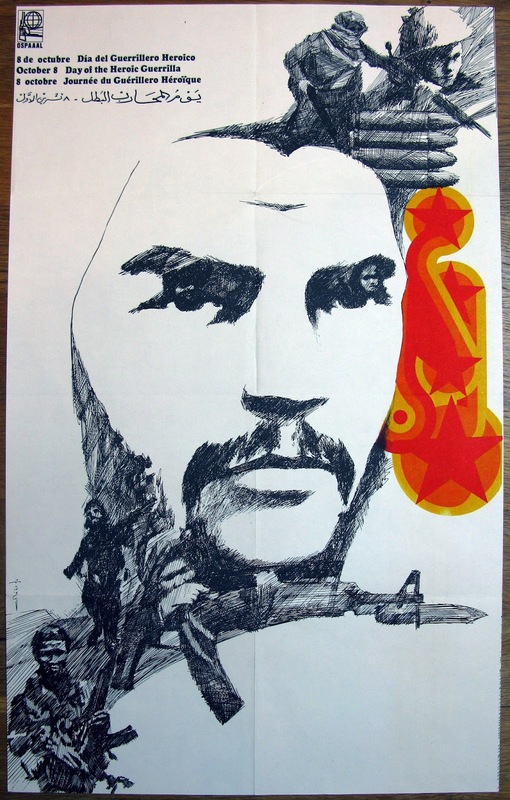 Typically the image features Che's efforts as a revolutionary fighter in the jungles of Bolivia and elswhere which ultimately led to his downfall and capture. The iconography is typical of Cuban posters including the military dress, trusty Kalashnikov rifle and ammunition.